Core Plate Coating is one of our Value Added Services. For over two decades, Laser Technologies has been core plate coating laminations as a value-added service to the motor and generator industry. Our experience and expertise is second-to-none when it comes to coating and refurbishing laminations. We maintain stringent controls over our process and employ an in-house Quality Control department to perform electrical testing that ensures our customer's specifications are met. Our coating line is equipped to run most commercially available C-5 and C-6 electrical steel coatings. We can perform individualized services or testing based on your requirements. Our core plate process can be applied to newly stamped or laser cut laminations, laminations after deburr, laminations with bare edges or surfaces, and even old laminations that you might think are too damaged to re-coat. 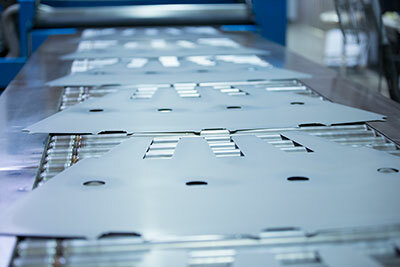 Refurbished Laminations Can Save You Money. Laser Technologies' can refurbish out-of-spec motors and generators by recoating old laminations and restoring interlaminate resistance, bringing your equipment back to optimal operating specifications. Even if some of your laminations are too damaged to re-coat, our expert staff can reverse engineer and laser cut new replacement laminations to supplement the ones that are salvageable. We use an industry leading process for re-coating old laminations. Our refurbishment process eliminates the possibility of an interlaminate shorts and can withstand temperatures of up to 1500?F. Contact us today to learn more about how our lamination coating services can save you money. Inorganic or mostly inorganic coating similar to C-4, to which ceramic fillers or film-forming inorganic components have been added to increase the insulating ability of the coating. The coating typically is a phosphate, chromate, or silicate coating, or combination thereof. Such coatings are applied to the steel surface and cured by heating. The coatings can be applied to grain-oriented electrical steels, non-oriented electrical steels, and cold-rolled motor lamination steels. A C-5 coating may be applied over top of a C-2 coating for applications in which extra surface insulation is required, for example, sheared laminations of grain-oriented electrical steel for cores of power transformers. C-5 coatings are used for applications requiring a high-surface resistivity. 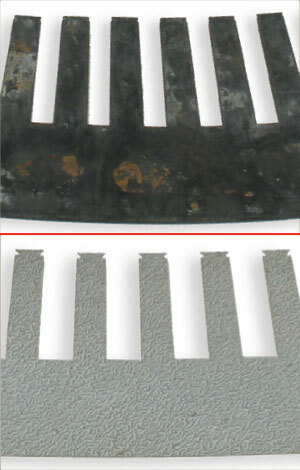 It is appropriate to designate a maximum Franklin test current for this type of coating before stress-relief annealing. The required Franklin test current is subject to agreement between the producer and user. 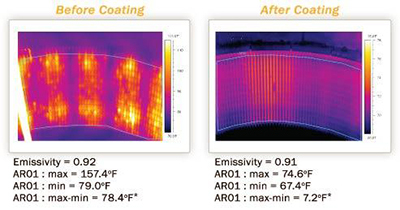 The coating will withstand stress-relief annealing up to 1550?F (840?C) in neutral or slightly reducing furnace atmospheres, but some reduction in surface insulation resistivity may occur during the anneal. The coating will withstand burn-off treatments at 600-1000?F (320-540?C) used to remove stator winding insulation during rebuilding of motors. The coating can be used in air-cooled or oil-immersed cores. In some cases, organic components may be added to C-5 coatings to enhance punchability. The applications, use, and properties of such coatings are similar to those of inorganic C-5 coatings. The user should consult the producer if there are particular concerns with coating off-gassing during welding or elevated temperature exposure of the coated steel. Organic-based coating to which inorganic fillers have been added to increase the insulating ability of the coating. The coating is applied to the steel surface and cured by heating. C-6 coatings typically are used for fully processed non-oriented electrical steels. It is appropriate to designate a maximum Franklin test current for this type of coating. The required Franklin test current is subject to agreement between the producer and user. The coating will withstand burn-off treatments used to remove stator winding insulation during rebuilding of motors, done at 600-1000?F (320-540?C), but is not considered to be a coating that will withstand normal stress-relief annealing. The coating generally improves the punchability of the steel, and hence, is suitable for stamped laminations.